What are you waiting for? Click add to cart Now to get your beautiful pet hair! Happy pets, happy you. Make your order now! Size: 7.2"x 1.8" x 0.3", 5.2"x1.8"x0.4"
Don't let your precious pooch be inflicted by matted or tangled hair. Help him or her out by promoting luster & lusciousness with our handy pet grooming tool. You'll make a big mistake if you wait. Hurry up. Click 'ADD TO CART' to place an order today! 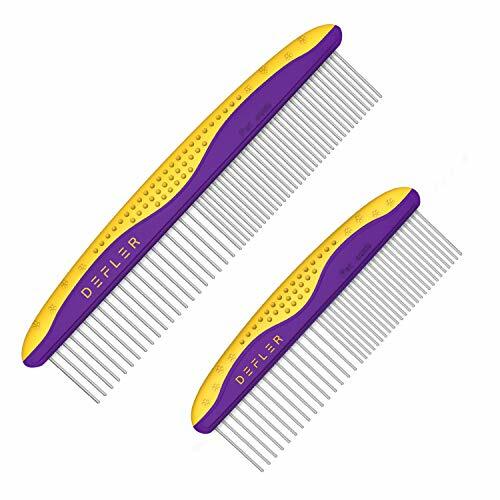 THE PERFECT COMB TO REMOVE TANGLES, LOOSE & SHED FUR FROM YOUR PET'S COAT - Defler pet combs gently remove loose hair, eliminates tangles, knots, mand trapped dirt. Work great on dogs and cats with all sizes and hair types. ROUND & GENTLE COMB TEETH - Unlike dematting combs with sharp teeth, this Smooth Rounded Stainless Steel Teeth prevents scratching and keep sensitive skin of your dogs or cats more SAFE. ANTI-SLIP HANDLE,COMFORTABLE & DURABLE - Our comb is especially designed with COMFORT-GRIP and ANTI-SLIP handle, which prevent the hand and wrist strain no matter how long you pet your pet! IMPROVES OVERALL PET HEALTH: Designed to gently massage your pet's coat, the anti-scratch teeth on our dog & cat comb naturally support the health of your furry best friend by boosting circulation,make your pet's coat more soft and shiny and your pet feel GOOD. RISK-FREE LIFETIME GUARANTEE: We firmly stand by the lasting quality of our pet grooming tool. If for any reason you're not 100% happy with it, reach out to us to receive a refund or replacement. If you have any questions about this product by Defler, contact us by completing and submitting the form below. If you are looking for a specif part number, please include it with your message.